Rain is not common in Southern California and when it shows up, it usually coincides with small craft warnings, and otherwise “stormy” conditions. Most Southern Californian dinghy sailors treat rain like most anyone else might treat a winter storm – they stay indoors. Had Lido 14 racers taken a closer look at the forecast they would have seen that chance of rain was most likely early in the morning and mild. The forecast was spot on as the rains were finished by about 7 AM. Now I know it’s a bit risky to trust a weather forecast but had you seen that it was spot on regarding morning rain, you might have concluded that the forecast for the rest of the day might be spot on too. And it was. And it was perfect racing weather! What had been predicted was a clearing westerly breeze in the range of 10 to 12 mph coming thru late morning and lasting thru the afternoon. Lastly, for those of us that know Newport Beach too well, any sort of rain will keep most power boaters off the water so the prospect of having little or no recreational power boaters on the race course was enticing. This too turned out to be the case. In short, we had excellent racing conditions all around but not as many boats racing as we expected. For those that showed up, a very big “thank you.” With 13 boats reporting to the starting line, we tried to keep things as lively as possible by sailing A and B divisions together. Stu Robertson, with his daughter Erin crewing, immediately set the pace by winning Race #1 – leading some to the conclusion that Stu may well blast thru to a 4th consecutive win at this regatta. But, as you can see from the scores, a number of sailors had at least one troubled race and with no throw outs, consistency mattered. And the most consistent racers were Kurt & Anne Wiese in the A division and Chris & Anita Rulla in the B’s – each team scoring the same position in 4 out of 5 races. In fact, there were legitimate reasons for a number of regular racers to not show up – they were still repairing their damaged boats from the strong Santa Ana winds that hit the W.D. Schock Memorial regatta a couple of weeks earlier. Unfortunately, we had a few breakdowns that reduced the fleet even further. Len Bose, barely dry from his capsize at the W.D. Schock Memorial regatta, broke his tiller extension coupler. Despite some emergency repairs, it didn’t hold so he sailed home and missed the last two races. Long standing Lido 14 racer Al Perez suffered an unknown tiller problem early on and went home too. Walter and Terry Johnson also suffered a mechanical problem with their centerboard but the R/C gave them some extra time to fix it so that they could stay in the regatta. The most tragic loss, however, was not due to equipment failure but by what appears to be either poor sportsmanship or a lack of understanding of the racing rules. I wouldn’t normally comment on this type of problem but it turned out that several incidents were very well witnessed and in one case partly documented on video and it was clear that major (i.e. race changing) fouls occurred yet penalty turns were not sailed nor were protests filed. As is too typical, the issue was “forgotten” despite claims of intent to protest, etc. It’s a shame especially considering the effort the regatta organizers took to encourage taking on the water alternative penalties (“a one turn” penalty). On a more positive note, the organizers of the regatta introduced a new program to help these matters however due to equipment problems, it wasn’t able to bring them to the course in time to help the above mentioned matters. In an effort to help racers understand that fouls are even occurring, we put observers (US Sailing certified judges) on the racecourse to signal (with a whistle) whenever they observed what appeared to be an infraction of the right of way rules. The idea is to use the whistle signals somewhat as a real-time on the water seminar on rules – just at the precise time the information may be of greatest value and impact. The signaling was not binding, was not a warning, and couldn’t be used as the basis for any protests, etc. The intent was that competitors would use the signal to help speed up their comprehension of the problem so that taking an alternative penalty would be more seriously considered – right then and there. In addition to observing and signaling, the observers made themselves available after racing to discuss rules questions – so that anyone could bring their questions while they were still fresh on their mind. For this reason alone, our “experiment” was a success because several people did consult with the observers and they learned a lot about particular rules. There are some cautions that to be taken using such observers – especially if they will serve as judges for protests at your event, so work with them and plan accordingly. We encourage other fleets to consider adding a similar feature to some of their events to improve the fleet’s knowledge of the rules and to encourage better compliance to the rules. Lastly, I would like to thank those that contributed their time, efforts, and in some cases more to the running of what we suspect was the 40th running of the Harry Wood (now Memorial) Regatta. This includes Race Committee Stephanie Faillers, Judi Gorski, Mark Hunter, Jeff Tighe, Judges Bill Marting and John Lee, photographer Bronny Joy, Registration help Nancy and Baily Davidson and special thanks to the Woods family – Barry, Andrea, Sheila, and Nicholas for being a continuing and valued part (and reason for) this event. **Grand Master Division scored separately. Won by Kurt & Anne Wiese. 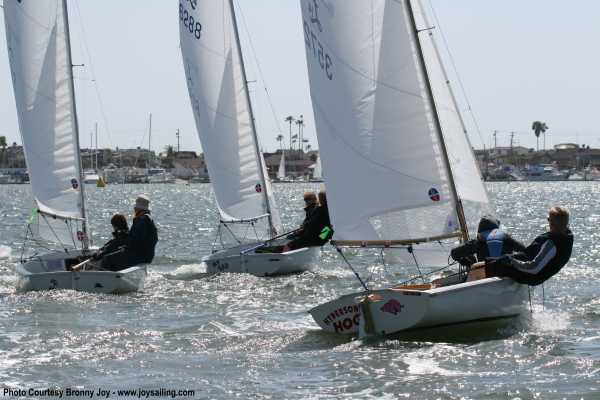 You are invited to the best Lido 14 regatta in Newport Beach! We pack five full length windward/leeward races into one day of racing, followed by great food and awards! Take special note that we avoid the moored boats in the bay! As I said before, it's the best Lido 14 regatta in town. And all for the low low price of just $15. So please print out the Notice of Race and Entry Form (below), grab a pen and fill out the Entry Form right now so you can join in the fun! Last year we had 22 boats show up. Please don't disappoint yourself this year by not showing up. Sign up now! On Saturday March 29th, we will be hosting an all day Lido 14 racing clinic. We'll be working both on shore and on the water (weather permitting). The clinic is free.